“There was an unholy nexus between the governmental machinery and the builders/private entities in devising a modality to deprive the innocent and gullible landholders of their holdings and jeopardize public interest which the acquisition was intended to achieve,” the court held. The Haryana Government had issued a notification under Section 4 of the Land Acquisition Act for acquiring 688 acres of land belonging to farmers for establishing an industrial township. Soon after the notification, various private builders approached the landholders and purchased the lands on the execution of sale deeds. Several landholders, faced with the threat of compulsory acquisition and paltry compensation awarded by the State, sold away the lands at Rs.20-25 lakhs per acre. It was later revealed that it was a throwaway price, as some other landholders who waited till the stage of award notification, obtained land value of Rs.80 lakhs per acre (which subsequently rose to Rs.4.5 crores per acre). Two days before the date notified for pronouncement of award, the state government declared on 24.08.2007 its decision to drop the land acquisition proceedings. Thereafter, the private builders who obtained the lands from the farmers approached the government for grant of licenses to develop the property as housing colonies, and such licenses were promptly granted. Having come to know that the lands under acquisition were now being utilized for private gain by various builders, the farmers started agitation against the process adopted by the government machinery. They also approached the Punjab & Haryana High Court alleging that the entire action of initiating the acquisition and thereby compelling writ landholders to sell off their valuable and fertile land at throwaway prices under the threat of acquisition to certain private builders and then dropping the acquisition just two days before the date fixed for declaration of award was deliberate and was fraught with malice. The high court dismissed the writ petitions holding that the prayer for setting aside the sale deeds executed in favour of private builders was not a public law remedy. Challenging the dismissal, they approached the Supreme Court. Meanwhile, FIR was registered regarding allegations of fraud and corruption in the land acquisition process, and the investigation was taken over by the CBI. ... this price or the rate shows the tremendous difference between the return received by the original landholders and the actual potential of the land. The court also noted that no license for development could have been issued under the Haryana Development and Regulation of Urban Areas Act, 1975 in an area notified for acquisition. Yet the concerned authorities not only entertained such applications for licence but pendency of such applications was taken as a factor for withdrawal from acquisition. Something which ought to have been rejected and discarded outright became the foundation for decision in favour of builders/private entities, said the court. A positive finding was entered that that the dropping of land acquisition process was done maliciously, amounting to ‘fraud on power’. The transactions so entered into between the landholders and the concerned builders/private entities could not be said to be voluntary and free from any influence. The unnatural and unreasonable bargain was forced upon the landholders by creating façade of impending acquisition. Public Interest was not the underlying concern or objective behind those decisions dated 24.08.2007 and 29.01.2010 but the motive was to confer undue advantage on the builders/private entities. It is clear that considerations other than those which were required to be bestowed, guided the exercise of power in arriving at decisions dated 24.08.2007 and 29.01.2010. The inescapable conclusion, therefore, is that there was an unholy nexus between the governmental machinery and the builders/private entities in devising a modality to deprive the innocent and gullible landholders of their holdings and jeopardize public interest which the acquisition was intended to achieve, observed the court while finding that the withdrawal from acquisition amounted to ‘fraud on power’. But how to remedy the situation and restore the balance? This was not an easy question to answer for the court, particularly in view of the fact that constructions were completed in many of the properties and third party rights were created. 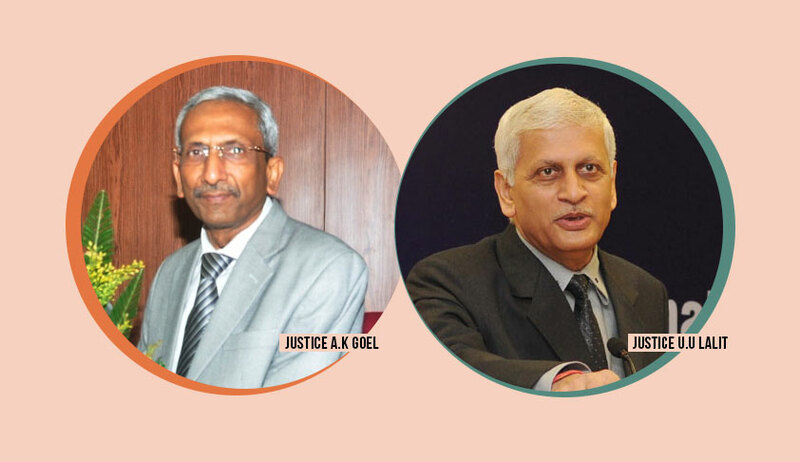 The court appointed CA Sundaram, senior advocate, as amicus curiae to assist in resolving the issue. While considering possible reliefs in the matter, the court was mainly guided by the precedent Uddar Gagan v. Sant Singh & Others (2016) 11 SCC 378. The question which arose for consideration, in that case, was whether the power of the State to withdraw from acquisition under Section 48 of the Act after the award had been passed, was utilized to facilitate transfer of title of the land of original owners to a private builder to advance the business interest of the builder. In that case, the builder had purchased the interest of the original landholders after the acquisition was initiated like in the present case and at his instance the lands were released from acquisition at which stage the original landholders had invoked writ jurisdiction and challenged the entire action. The high court set aside the release orders, quashed the acquisition and went on to direct that the lands be restored to the original land-owners. The Supreme Court approved the high court decision to the extent it set aside the withdrawal from acquisition. But the court did not disturb the acquisition and held that the land will vest with the state. However, in the instant case, unlike Uddar Gagan, the acquisition proceedings were withdrawn before the passing of awards. The Bench also directed that the State may revisit its policy of change of land use and giving colonization licence in respect of land which is subject matter of acquisition. The court had to do a fine balancing of the interests of the landholders as well as public interest supposed to be served by the land acquisition process. The major difficulty was that all the landholders were not present in the court, and some of the land holdings were actually utilized for public purpose upon conclusion of land acquisition proceedings. The transactions entered into between the landholders and the concerned builders/private entities in the present case were held to be not voluntary and were brought about by fraudulent influence. The decision of the state government to withdraw from acquisition was held to be in bad faith amounting to ‘fraud on power’ and was set aside. The licenses to the private builders to set up colonies were held to be granted invalidly. The licenses will stand transferred to Haryana Urban Development Authority/ Haryana State Industrial Development Corporation. The land acquisition proceedings, which were aborted short of passing of award, have to be taken to their logical conclusion till the passing of award. The amounts paid by the private builders/retailers to the landholders are deemed to be awards passed under the Act. However, the landholders have the right to seek further enhancement by resorting to reference under Section 18 of the Act against the deemed award. The builders/private entities will be entitled to refund/reimbursement of any payment made to the landholders or the amounts that had been spent on development of the land, from HUDA or HSIDC. The third parties from whom money had been collected by the builder/private entities will either be entitled to refund of the amount from and out of and to the extent of the amount payable to the builder/private entities available with the state, on their claims being verified or will be allotted the plots or apartments at the agreed price or prevalent price, whichever is higher. Every such claim shall be verified by HUDA or HSIDC. In cases where, constructions have been erected and the entire project is complete or is nearing completion, upon acceptance of the claim, the plots or apartments shall be made over to the respective claimants on the same terms and conditions. The Bench has also directed the CBI to conduct a full fledged investigation in to the whole issue. "As found by us in the preceding paragraphs, substantial sums were made over to “middle men”. In the pending investigation, the CBI may do well to unravel the truth. In any case, such hefty sums which were made over to “middle men” cannot be said to be rightfully earned by and belonging to them. In fact, this actually represents the return for being able to garner the lands in question and getting requisite licences under the provisions of the Haryana Act and a benefit derived out of fraud on power. In our view this money rightfully belongs to the State and none other. We direct the authorities of the State as well as the Central Government to reach the depths of such transactions and recover every single pie and make it over to the State Government. A complete investigation in the transactions including unearthing unnatural gains received by “middle men” shall be undertaken by the CBI".